If you want an IT based system that allows you to create trouble tickets, collect all documentation and assets, and is intuitive so that your'e not "administering administration", Freshservice is a good solution. Their support team is very helpful and responsive, and it was attractive to us since it was cloud-hosted. If you do not plan to take advantage of the CMDB or change management options, you may be better off using the simpler and inexpensive product, Freshdesk. Problem Management: we have a lot of P1 and P2s and as per our process we need to have the proper level of explanations for each issue and help remediate. To help with ITSM: it definitely helps us with our future changes and keeps track of our changes in following the process and also to have a log of critical production changes. It helps us maintain a great IT database for all the ongoing activities and helps refer to problems with simple searches. While the CMDB is robust and helpful, you don't have much control over the view when looking at the preview grid. We previously used the sister product, Freshdesk, and we appreciated the built-in chat feature. It would be nice to see Freshservice add this to their product so that we don't have to rely on third-party systems to communicate inter-departmentally, or with constituents. The ticket system is intuitive and has some great features. But one of the things that is inherent with technical support is multi-part tasks related to a particular solution. While Freshservice allows you to create tasks that must be completed which you can assign to any of the other agents, it would be nice to be able to create task templates for situations that require several standard sub-tasks. For example, with computer setups if you could apply a "setup" template that identifies the various steps that must be completed so that you can monitor progress more closely, and offer quality assurance. Well not so great and hence we replaced it with CA service desk. It was replaced later by another ITSM, which I can say is a negative as users had difficulty using it and educating themselves. It's certainly not inexpensive, however, it can be helped with some long term discounts on the modules to lure and keep their customer base. 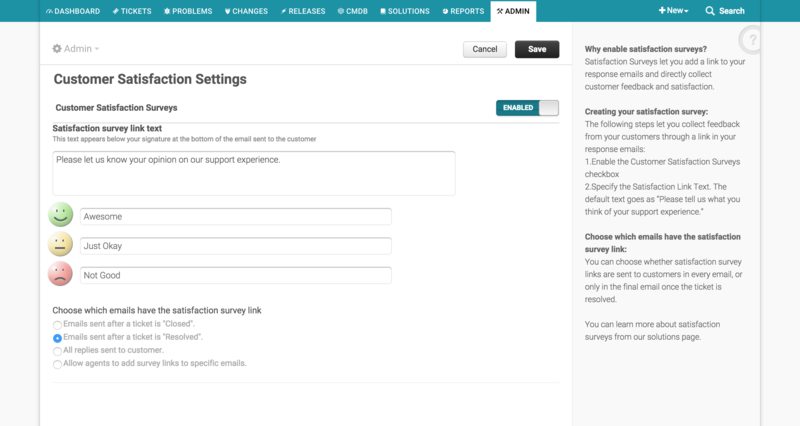 Customer Satisfaction Survey - Improve your customer satisfaction levels with our instant surveys.